After ten weeks in Scorpio, Mars is finally moving on. Actually, we’ve had more than ten weeks of this no-let-up transit. From January through the start of March, Mars tenanted Scorpio. From March through roughly half of its retrograde cycle it travelled in Sagittarius. Mars returns to Sagittarius on the Leo new moon on August 2 and continues through September 27. Mars in Scorpio has put a soul agenda into a power play, dig deeper, keep digging cycle. While Mars in Scorpio drills down and through, Mars in Sagittarius aims for up and over. Mars will take what has been accessed thus far and will now go the distance with it or move beyond way beyond it. Just like the Olympics, Mars in Sagittarius sets the mission into full swing. Coinciding closely with the timetable for the Olympics, Mars is on a finish-up agenda with Saturn in Sagittarius through August 24. Do you feel a growing sense of “its time”, or that time is growing short? Yes, it is. Mars on its approach to Saturn can put us on an inevitable or a momentous journey, or an inevitable or a momentous race against the clock. In out-of-bounds travel (a dynamic condition) through October, Mars continues to call the shots and puts added thrust into our get-go. Independence initiatives gain better traction. Change does too. While Mars is the god of war, aim to put inspiration rather than anger to the forefront. It’ll will produce much better mileage. Venus enters Virgo on August 5, the same day the Olympics in Rio begin. Mercury has recently entered this sign and Jupiter will complete it’s one-year stint in Virgo mid September. Rio’s water quality, the Zika virus, the threat of terrorism, daily health and safety risks; the anxious world is on watch for our Olympians and for citizens everywhere. August 18: is it or is it not a lunar eclipse? Noting the sun/moon opposition is eighteen degrees from the lunar nodes, it is debatable by astrology as well as astronomy standards. Still just by the fact it is full moon, the date is noteworthy. The full moon in Aquarius keeps politics, terrorism, weather extremes and social life/social matters on the front burner. The message of this full moon is to take a risk on a new you, on a reinvented lifestyle. It starts with an attitude. The full moon is an acceleration influence. It can prompt a breakthrough, or free up, unblock, unleash, or spark something significant. Once it does, it is up to you to dive in/make a full investment. It’s an opportunity to jettison forward, so don’t hang back. The full moon/lunar eclipse involves Sedna, the Arctic Seas Goddess. This influence can unlock it, mine from buried treasure, or prove to be “break the glass ceiling” influence. Of interesting note, this eclipse was triggered by Mercury on July 27 when Donald Trump asked Russia to spy on Hillary and when Hillary’s presidential nomination by the Democrats actually broke that glass ceiling. It is also triggered by the transit of Venus on August 1. Saturn ends its four month retrograde on August 13, triggering the degree Mars held when it turned retrograde on April 17. That Mars trigger and Saturn’s position for the month of August continue the work that was started back in mid April and they are also stimulants for the Solar Eclipse in Virgo which happens on September 1. A solar eclipse will always mark an ending and a beginning of significance. Coinciding so neatly with the start of back to school and work season, this Solar Eclipse should make all of us feel in the right frame of mind to get onto task and to hone better study habits and work methods. Having said that, it might take some time to acclimatize or to get into a productive routine due to the occurrence of Mercury backtracking through Virgo from August 30 to September 21. Mercury retrograde can keep us on a time extension regarding corrections, adjustments, repairs, clean up, clear it away, sort it out, fix-it, heal-it. Our pets can need extra tending to also. 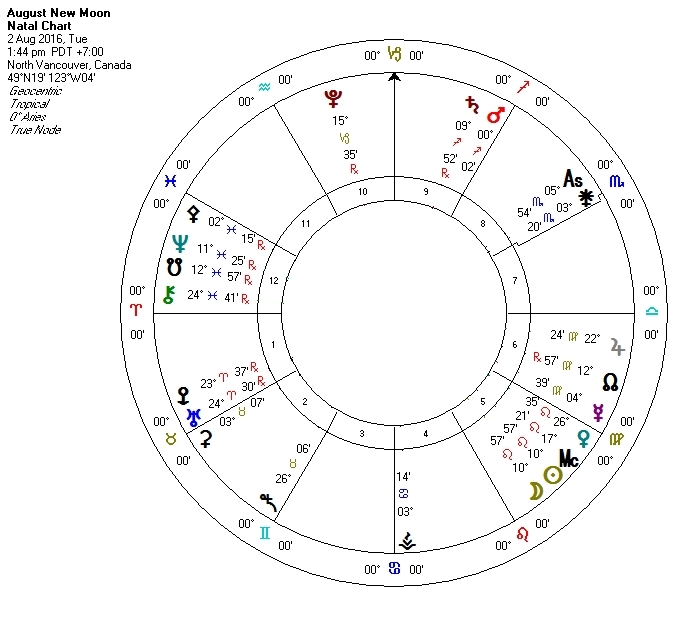 Encompassing the eclipse and the shadow phase before the retrograde cycle starts, note that from August 18 to 28, Mercury, the communication, broadcast, and transport planet, also the ruler of the north node, (one half of the karmic axis) is activated. Stay alert. Something of karmic significance is in the works. Lastly, while there’s plenty happening with the stars in each week, especially August 18/19, 24/25 and 30, there’s major stars in play on the weekends too. Expect to move through plenty in the month ahead and aim to make the most of what you have to work with. The recent retrograde turn of Uranus in Aries and Mars launching into Sagittarius on the Leo new moon of August 2 will help you to get better directed. Mercury and Venus (starting Aug 5) in Virgo will provide you with enough to work on. With Mercury turning retrograde in Virgo at the end of the month, expect to be on an extended fix-it, heal-it, upgrade-it, or clear-your-clutter project through most of September. The end of Saturn retrograde on August 13 can bring you to completion point, or a past-the-post threshold. Although you are still on a finish-up until Mars meets with Saturn on Aug 24, the week of Aug 14 is opportune/can get something more going. The full moon/lunar eclipse happens on Aug 18, but it’s been activated since the end of last month and the beginning of this one. If you have planets at 25 degrees of Aquarius/Leo or Taurus/Scorpio, then you will already know what this one is about. If it does not hit your chart directly, then Aug 18 will simply come and go like any other full moon in Aquarius. It can spark tension, strain, excitement, a breakthrough, breaking point, or release of significance, the unexpected or opportune. Take full advantage of the last weekend of the month. August 27/28, Venus/Mercury and Jupiter set a great backdrop for events, celebrations, talks, visits, travel, moving, shopping and for getting your pleasure fill. Take care of your health and as best you can try stay on top of what’s necessary throughout the month so that you can minimize on the potentials that are typical of a Mercury retrograde cycle. August opens on an upbeat with a new moon in Leo shining a brighter light on home, family, and your emotional wellbeing. Mars into Sagittarius, starting on August 2, puts added attention on gaining better ground regarding finances, career, creative endeavours, intimate relationships, and health. In all these areas, it can be a matter of giving up to get. First, you may need to free yourself up or to create more room before you can take on more. Need/want to move yourself to higher ground? Operating from a background or undercurrent position, Uranus will keep prodding or nagging at you until you get the message and you do something about it. The end of Saturn retrograde can take the brakes off but there’s still more to paving, polishing, or finishing to do until August 24 when Mars and Saturn meet. This ends a two-year learning curve and starts you on your next workbook. Mercury, Venus, and Jupiter in Virgo are of great benefit to you, They’ll help you to refine, edit, correct fix, discern, change and upgrade where it makes the most significant impact. Yes, there’s always room for improvement. Of course you can do better/make that good thing better yet. Look for this trio to deliver the goods August 27 and 28. This a major trigger-it, switch gears, and/or turn-the-corner time. As of August 30, Venus enters Libra. As of August 31, Mercury in Virgo turns retrograde, and on September 1, there’s solar eclipse in Virgo to boost you. The solar eclipse can prove particularly opportune for matters of the heart and wallet if you are born at the end of April/start of May or if it hits your chart directly. One way or another, Leo month gets you mobilized. The first few days set you off to a great start. While it’s a good month to play and to top up on the good stuff, Mercury, Jupiter and Venus in Virgo also suggest it’s also an appropriate time to work on renovations, upgrades, fixes, and on clearing your clutter (materially, mentally, and emotionally). Chip away at it this month and you’ll get plenty accomplished. August 13 through August 24 can see you work your way through something or to something. Note that August 16 to the lunar eclipse on August 18, synchronicity and opportunity are on your side. It’s a good few days for travel, visits, public events, special occasions exploring, or for trying your luck. Something out of the blue could make your day. The last weekend of the month can be especially full to the brim and/or put you or your wallet on the go. Try to get yourself well organized earlier in the month but also allow an extra leeway of time or budget for the unforeseen extras. Mercury turns retrograde on August 31. Start of the month supports you to get in better shape regarding health, work, or working-it-out. As of August 2, Mars into Sagittarius sets you onto task with a greater heave-ho. Along with more drive, both Mars and Saturn put greater need on the front burner too. By the time Mars meets up with Saturn on August 24, either you’ll have some results to show for your efforts or you’ll have a better handle on what isn’t working for you and what you need to clear out of your way. Venus and Mercury travelling through Virgo for the month help you to sort out who and what is most worthy of your time. They also help you to communicate and reason more effectively, to spot a better bargain and to negotiate a better deal. In addition to a good weekend to decompress or take a breather, August 12 to 14 can remove a block, dissolve a mindset, or see you turn a corner. Things fall into place and/or accelerate, perhaps unexpectedly from August 16 to the Lunar Eclipse on August 18. Something lucrative could show up. Too, the eclipse can be an important ice-breaker influence. August 24 to 28 are also a significant move-along or let it go time. Aim to get it finished, repaired or readied, but also know that Mercury retrograde, starting August 30 can backtrack, derail, delay you, or extend the time it takes. The positive attribute of Mercury retrograde is the ability to reconnect, revisit, resume or redo. You can pick up where you left off previously, rebuild on a previous success or get an opportunity for a second interview or a second chance. August 1 to 3 your stars are in great shape. Make the most of it, enjoy. The August 2 new moon and Mars into Sagittarius are good for an energy boost. They also set a good launch-pad for a vacation, travel, performing, celebrating, weddings and all other matters of the heart. Venus leaves Leo for Virgo on August 6, joining Mercury and Jupiter in this sign. Together they keep you productive. Yes, by all means it’s an opportune time to invest yourself and to work on the improvements you know will give you more bang for your buck. The lunar eclipse can be particularly notable for you if you are born on or near August 18, but of course a full moon in Aquarius is always notable. Watch for added excitement, a great opportunity worth jumping on/racing for, or for something to hit out of the blue. A special event or a special someone can claim the spotlight August 16 to 18. Sparks can fly for a new relationship. Sparks also fly for one that is conflict riddled. To the plus, the eclipse can accelerate a new personal, relationship, lifestyle, or career trajectory. (Even if its sudden and unexpected, the Aquarius eclipse means to point you in the direction of improvement.) As stated in the intro, while the eclipse itself may not be as dynamic as other eclipses, if it’s affecting you, you’ll feel it. What’s in motion for you is likely already well under way and will continue to hold its energy charge in the weeks and months to come. While there’s over the hump, surpassing to do, or a foundation to set, by the time Mars and Saturn meet up on August 24, you should feel that you have reached a significant marker point or threshold. A two- year cycle completes and a new one begins. Mercury retrograde, starting August 30, can extend your healing time, your research time, or require more clean up/fix up, work, or investment from you. The positive side of the transit aims to give you an opportunity to sort it out better and/or to nip it in the bud. If there are flaws, mistakes, or reasons why you should not rather than should, it’s better to know/jump ship sooner rather than later. Opening the month, the sun’s trine to Saturn on August 1 and the new moon on August 2 boosts your confidence level and sense of I deserve. Even though there’s still plenty further to go, you’ll have to admit you’ve come along way. “I’ve made it this far” has been no small feat. Wear the t-shirt with pride. Mercury has recently entered Virgo, Jupiter is now on the last legs of a one-year stint, and as of August 5, Venus also moves into your sign. Through the end of the month, Venus puts you in a state of attraction and helps you to enhance what Mother Nature gave you. By all means help yourself along. Do what you can to be an attention getter, aim to be seen and heard. Is it time to renew your gym membership? Venus and mobility planet Mercury assist you to get in better physical shape too. Venus turns a corner with Mars while Mercury turns a corn with Saturn on August 6. Both can see you make progress regarding a personal or relationship issue. Saturn ends retrograde on August 13; the same day Venus turns a corner with Saturn. Whether its an evaluation or a reality, these planetary influences act as crystalizing momentums. Even so, for every corner turned, there’s an unknown or an uncertainty that immediately follows. At the same time potentials are also setting up. When/if the navigating gets tricky, not to second guess so much or to reach for the box labelled fear. August 14 to 17 and August 22 to 28 provides you with a good run of opportune stars. Place your faith in I deserve and trust. The full moon eclipse on August 18 can surprise you; it could be gifting. Perhaps what occurs will fall into the category of a saving grace. Noting it is an Aquarius full moon, there’s always an element of the unexpected. No matter how it strikes, it will move you/matters much faster along. You could stumble upon a new solution, fix, or tool. It’s a good time to meet with a specialist, to have or schedule surgery. Take a chance on a new job, launch a new project, explore a new financial investment or track, dive into a specialized training course. August 27 and 28 can be good for connecting, sharing, shopping or for one last getaway before back to school month and Mercury retrograde begins. Keep your plans, opinion, time, and ambitions flexible. Mercury will retrograde in Virgo from August 30 to September 21. You could find yourself on a rethink or a backtrack. You may need more time to fix it, heal it, or to sort it out. Starting on a great new moon in Leo, the first week of the month can brighten your social life, your finances, and give you something new to think or talk about. Make full use of your time and opportunities while the getting is good. Venus leaves Leo for Virgo on August 5 but it will continue to work as a positive influence, helping you to get a better handle on what’s real and viable. Along with Mars moving along in Sagittarius, the end of Saturn retrograde can take the brakes off something that has held you up or stymied you for awhile. Aside from a good vacation week, the midweek of the month (August 16/17) can also be lucrative or opportune. Social, financial, or what have you, the full moon/lunar eclipse on August 18 could see something unexpected land in your lap, wind you up or speed you up, or bring added expense. If you need to regroup, take your time. By the following weekend you’ll have the assistance of Venus/Mercury and Jupiter to help you talk, connect the dots, negotiate a deal, or scoop a bargain. Together they also make for a great getaway or special event weekend. Mercury in Virgo travels retrograde from August 30 to Sept 21. Operating from a background or less obvious position, the retrograde can stir up a potential or expose something unforeseen. Start with the premise that you might not know everything you need to or should and keep asking more questions. Things can go missing, you can be more forgetful or not register all that you should. Guard your health and make sure you drink clean water, stay hydrated, etc. If you feel confused or uncertain, bide your time. As of the Leo new moon on August 2, Mars finally leaves Scorpio for Sagittarius. Due to this year’s retrograde, you’ve had an extra long run of Mars. As the saying goes, when the going gets tough, the tough put on better boxing gloves. Some of the transit has set opportunity into play, and some of it – perhaps most of it – has likely been a major battle. Hillary Clinton knows this as fact. Mars in Sagittarius gives you more to work with, for and toward. Juno, the contract asteroid, in Scorpio through November, gives you great stick-to-it. It also underscores the karmic nature of your present circumstances. The past four months of Saturn retrograde in Sagittarius has helped you to refortify from within. August 13, Saturn ends retrograde and on August 24, Mars joins with Saturn, to complete a two-year investment and begins construction on the next phase. While Venus in Virgo (August 5 to 30) is a helpful influence for making up for lost time with folks and for explaining, negotiating, repairs and upgrades, note that Mercury begins retrograde in Virgo on August 30. Know you another conversation could be necessary. Mercury retrograde can also necessitate that retrace your steps, revise projects, ambitions, plans, or goals. You’ve already had a taster of Mars in Sagittarius earlier this year. As of August 2, Mars will re-enter your sign. Coinciding with a new moon in Leo, you should feel this as a great energy, confidence, and inspiration boost. Mars will continue to move along now but through August 24 it will continue to work to regain this year’s lost ground. At the same time, it is also on the finish-up of a two-year manifesting cycle with reality check planet Saturn. It’s a process. Bit by bit, or layer by layer, August 5 to 7 and 13, 14 can see you sort out or get past more. Preceding the full moon eclipse, August 16 and 17 could kick start something opportune. Seize the moment. Then again, these stars can simply mark a good week for a vacation or for letting yourself off the hook. They are also good for rustling up something social. August 27 and 28 can get a fresh dialogue or new plan started. Too, watch for an opportunity to correct, fix, heal, or upgrade. Considering that Mercury begins retrograde just a few days later, these dates can give you something more to go on that helps advance a plan, project, relationship or financial problem. Mercury has recently moved into Virgo, Jupiter has been there for almost a year now, and as of August 5, Venus treks into this complimentary sign. Together all three help you to make the most of what you have to work with. They also help you to make up for lost time, to fill in the blanks, or to find what was previously missing. August 6, and 13 to 16 helps you to be a better observer and reader, to work the kinks out for yourself and to add or subtract where it serves you best. Whether or not you have something special on the go, the week of August 15 keeps it stimulating, fresh and on the upbeat. August 27 and 28 are also great for matters of the heart or wallet. Indulge, enjoy, make the most of it. As best you can, tend to what’s necessary and try to stay a good step ahead of Mercury retrograde which begins on August 30. At the same time, make sure to build yourself extra leeway so that once the retrograde begins, you can revise or revisit, etc. if you want or need to. Mars into Sagittarius, starting August 2, can put a fresh wind under your wings. The first few days of the month help you to accomplish well. They also help you to get good satisfaction out of the time you spend with others too. Mercury has recently entered Virgo and on August 5, Venus will get there too. Both turn your attention to budget matters and to getting the best deal you can. Are you getting enough out of your significant other? Out of your job, your efforts, your money? Both also draw more attention to the shortfalls, necessities, or missing elements. To the plus, they are good for decluttering, downsizing, or getting better on track with money management, plans, health, diet, etc. Then again, perhaps there’s no other choice but to get to work! August 16 and 17, the stars are in your favour. The lunar eclipse on August 18 can be particularly opportune, instigating, liberating, or catapulting if you are born on or near February 25. While these few days can be eventful and accelerating, the eclipse effect has already been in effect for the past couple of weeks. Yes by all means, take the reinvented you out for a test drive. What? Haven’t started yet? What are you waiting for? Mercury, Venus and Jupiter are well aligned in the last weekend of the month. Take full advantage of time and opportunity. As of August 30, Mercury in Virgo begins retrograde. The Leo new moon on August 2 can improve matters to do with health, work, or working it out. Mars into Sagittarius can help you to rein it in better and/or to get yourself under better control. This Mars transit reminds you to stay results driven and helps you to reason it out from a more practical viewpoint. Mercury has just entered Virgo and on August 5, Venus will get there too. Both are good for clearing it out and for cleaning up your act. Don’t let guilt or misgivings be the driving force though. Do your best to maintain healthy, good for you habits and to stay on top of what you need to. If you do, you’ll minimize the potential pitfalls or losses of next month’s Mercury retrograde (August 30 to September 21). The lunar eclipse August 18 and the day’s pre and post it can bring something unexpected, perhaps opportune. Try something new on for size, it could be good for you. By August 24, Mars meets with Saturn. This can bring you to an important goal post or threshold. It is both an ending and a beginning time. With Mercury/Venus and Jupiter well aligned in Virgo, August 27 and 28 are great for getting a move on and for making the most of what you have on the go. Mercury retrograde starting August 30 could take you through another round with someone or something.